The Deluxe Police Station is a Civic Building that provides Police Protection for your Sims that was added in the Rush Hour Expansion Pack. Police Stations reduce crime by a variable amount dependent on their funding over a variable radius which can be adjusted using the Vehicle Funding slider in the building's Query Panel up until there are no more unused jail cells. 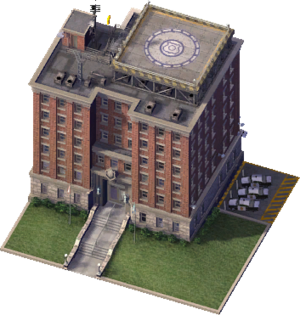 The Deluxe Police Station is the most expensive and effective Crime-fighting solution in SimCity 4 Rush Hour/Deluxe, with an increased monthly cost, more dispatchable cars, a stronger crime-deterring effect, a wider coverage area, the most on-site cells outside of the Jail. All that and it's the only way the coolest thing ever. A POLICE HELICOPTER! Well, it's the coolest thing ever according to Neil Fairbanks. It is positioned above the Large Police Station in Crime-fighting power and facilities with no other Police Station surpassing it. However, the Jail can hold more criminals at the cost of no local crime-fighting effect or dispatchable vehicles. This page was last modified on 5 February 2014, at 15:00.